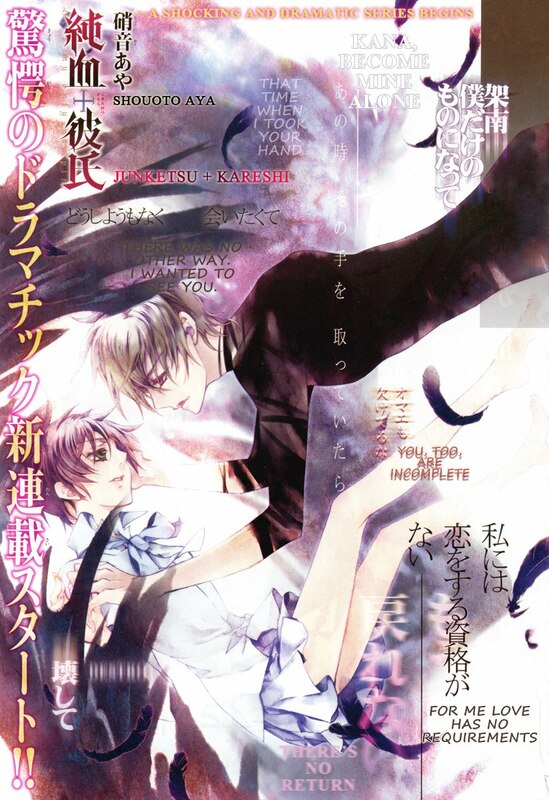 “Junketsu + Kareshi” (“Pureblood + Boyfriend”) is another new series from “Aria” magazine. I will definitely be translating the second chapter because I want to know what happens next and the chapter left me with lots of questions. As with “Pika Ichi,” I will decide whether to continue this series based on the second chapter. As always, your feedback is appreciated and wanted. 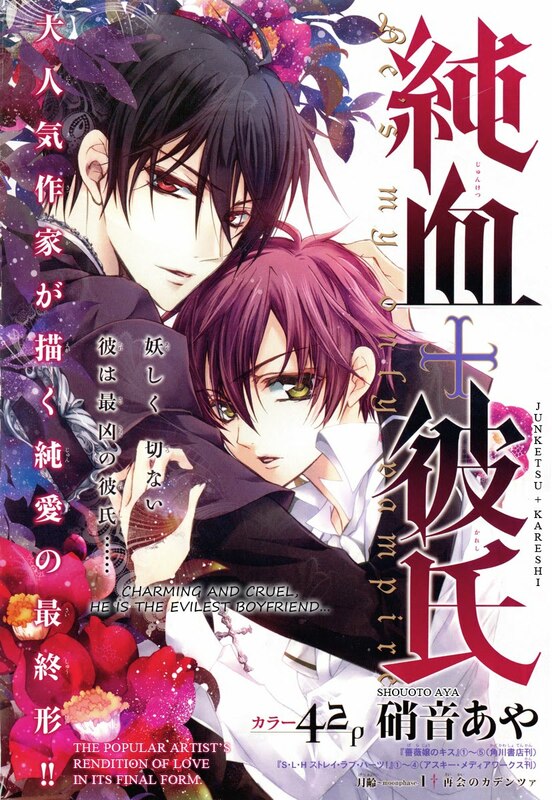 This is yet another vampire romance, however, this particular vampire does bite and he may not be a nice guy. I have a lot of hope for this story because I’m tired of vampires who don’t act like vampires. This series is quite interesting. The first chapter left me with a lot of questions. I think this one has potential. Looking forward to the next chapter. It's another Shouto Aya work! If you haven't seen her works yet, do read Barajou no Kiss and SLH. I somehow have a feeling that it'd be like those mangas of hers… ><;;; Though I don't understand why she keeps bringing in new mangas when she hasn't finished her other series. @Ginkojyun — According to Baka-Updates, SLH is complete. It ran a total of 5 volumes. It looks like Turtle Paradise is up to volume 2 in the translation of that series. As for BnK, I started reading it, but I was having a hard time getting past the first chapter. I'll try again. BnK is still running in Asuka magazine. I am a fan of SHouto Aya!!! She is my favorite mangaka!! Well… thank you for your translations, Kuroneko!!! I'm looking very forward to this series, thank you so much for taking your time to scanlate these wonderful works for us! I can't wait to see the next chapters! I didn't think I would find this chapter interesting. I'm getting tired of vampire stories. Besides, it didn't seem particularly original. But I liked it. It was intriguing and the atmosphere was nice. However, I don't know if it will be the same with the next chapters. I hope I won't get bored. @Caroline — Yes, I agree there's nothing particularly original about this first chapter, but I too enjoyed it. And my concern about the second chapter is the same as yours. Unless the story reveals itself to be truly unique, I don't think this is a series I will continue despite the beautiful art and fine character drawings. We only have a little more than a week to find out :). I hope it's good. Shouto Aya is the best and this manga is one of the best in the vampie gernre!I might like it even more then Vampire Knight, I beg you to scan this one until the end if nothing else!Thank you for the work you do!by the way how many volumes or chapters are there, or is it still ongoing? There are currently 6 chapters released in Japan. 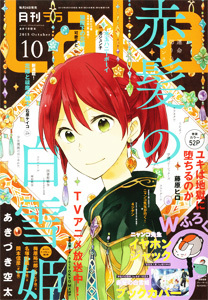 The series runs in Aria magazine which releases monthly on the 28th or 29th. Next Next post: I Finally Have Lala DX 9!